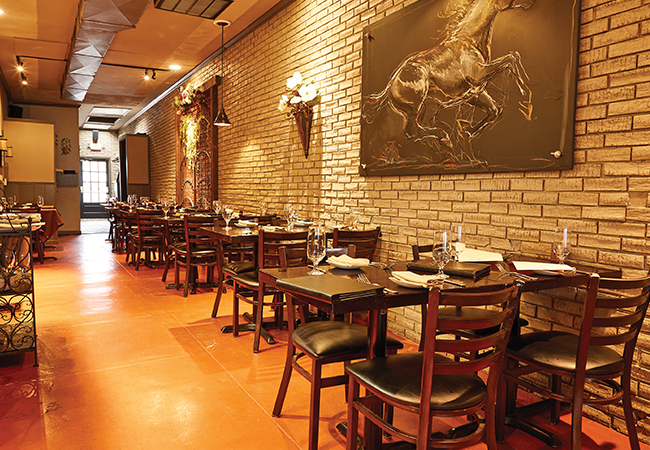 Cozy, charming La Chasse has a new chef in the kitchen and exciting new culinary creations on the menu. Nancy Miller shares a taste of Kristina Dyer’s delicious and daring new direction. 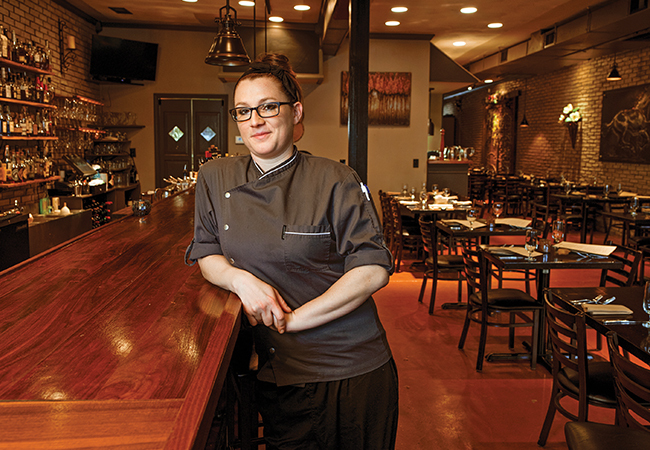 Kristina Dyer isn’t a new name on the Louisville food scene. She has worked at Café Metro, Le Relais, Seviche, Butchertown Grocery and other high-profile restaurants around town. Now the executive chef at La Chasse, she’s taking on her most formidable challenge yet, and she’s loving it. If she hadn’t jumped on the chef track, she probably would have become a teacher. Her inner educator still flourishes as she patiently takes time to explain to her kitchen staff her vision for a particular dish and the intricacies of preparing it and taking it to another level. 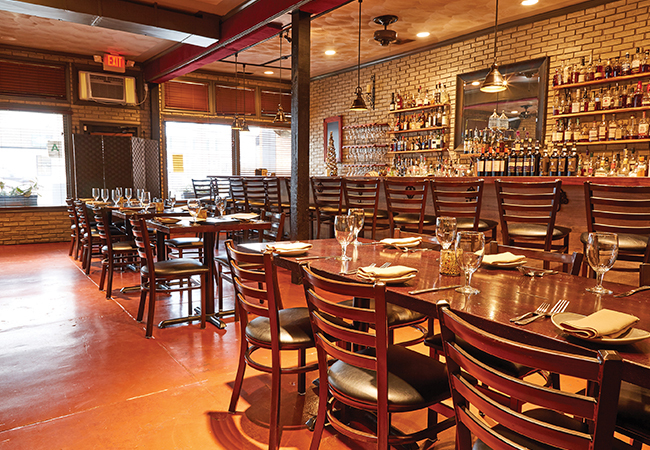 In her new role, she’s veering slightly away from La Chasse’s initial concept of Southern French/Spanish fusion, although distinctly French options such as cassoulet remain. To coordinate and complement her menu in relation to Fox’s seasonal craft cocktails, she cocoons in her living room, with six notepads, a laptop and cats by her side. From that behind-the-scenes planning comes dishes such as lamb Porterhouse with curried cauliflower and fingerling potatoes, duck confit and waffles, and ricotta gnocchi. She rarely has time to eat an entire dinner before service begins, but given the chance, she might opt for the scallops with curried lentils with butternut squash, cucumber-garlic labneh and lemongrass beurre blanc. Will pork fried rice and ebelskivers appear on her La Chasse menu? 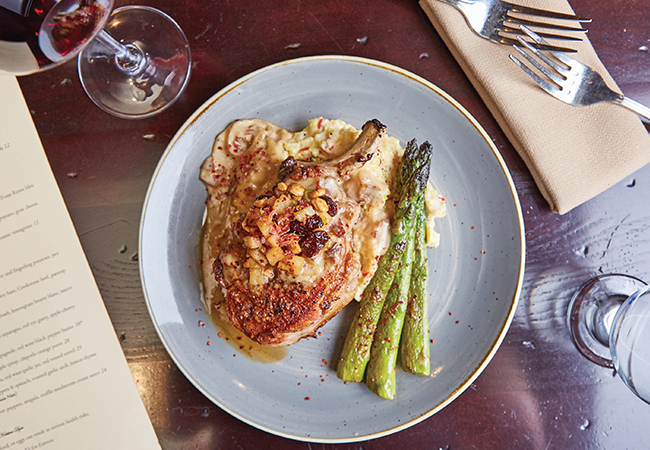 Maybe not, but a Country Pork Chop with Red Eye Gravy is a menu star. Lucky for us, she’s sharing it with TOPS readers. I have the utmost respect for Anthony Bourdain. His death was such a loss to the culinary community. What’s the craziest request you’ve ever had from a diner? Someone had recently undergone surgery and asked us to blend their steak. (It wasn’t at La Chasse.) We did little tasting cups of blended steak, vegetables and mashed potatoes. Most of us can only wish to cook like a professional chef. Are there any cookbooks you can recommend to help us? I enjoy On Food and Cooking: The Science and Lore of the Kitchen. I like The Escoffier Cookbook because I like Old School Techniques. And the Culinary Bible is great. You must have seen some disasters in the kitchens where you’ve worked. Want to tell us about one? I once worked for a chef who, in the middle of the rush, dropped a whole sheet tray of short ribs. The kitchen went silent. He just walked out of the kitchen and left the restaurant. I said, “Let’s keep trucking.” He came back in 15 or 20 minutes. What’s your idea of the perfect feast, if you didn’t have to prepare it? I love tapas…a table full of different types of hummus, some dates, charcuterie…a huge spread of little bites. I get bored eating one plate of the same thing. No. I’m single. Cooking for one isn’t fun. But if my mom comes over or my sister is in town, I’m the first one in the kitchen. On my day off, I’m tidying up the apartment, being lazy, watching television and opening the door to the pizza delivery. Preheat oven to 450°. Preferably in a cast iron skillet, heat the oil. Season pork chops with salt and pepper. Sear chops on both sides until they are golden brown. Place them on a baking sheet. Bake until the desired temperature is reached (145°-150° for medium rare, 150°-155° for medium, 155°-160° for medium-well, 160° for well-done.) To serve: Place the grits on a plate. Top with a pork chop, redeye gravy, agrodolce and Korean chili flakes. In a saucepan, bring milk and cream to the point right before simmering. Whisk in grits. Reduce heat to low, continually stirring grits so they don’t scorch. When mixture reaches the consistency of slightly thickened oatmeal, add peppers and scallions. Remove from heat. Whisk in cheese, salt and pepper. In a small sauce pot, melt the butter. Whisk in flour and cook until a blond roux forms. Whisk in cream slowly to form a bechamel. Bring to a boil. Reduce to simmer for three to four minutes. Remove from heat. Add nutmeg, salt and pepper. Stir in cheese until it is completely melted. Set aside. In a small saucepot over low to medium-heat, sauté onion and garlic in oil until caramelization begins. Add ham; cook two to three minutes. Deglaze with espresso liqueur; reduce by half. Add coffee and brown sugar; bring to a boil. Add cream; return to a boil. Reduce to a simmer. Whisk in Mornay. Cook over medium-low heat until gravy thickness is achieved, stirring often as to not scorch the bottom. Add Tabasco, salt and pepper. In a small sauté pan, sauté the apple the oil. Add cherries and hazelnuts. Cook for two to three minutes. In a small skillet, combine sherry vinegar and brown sugar. Reduce by two-thirds. Deglaze the cherries and hazelnuts with four tablespoons of the cherry reduction. Reduce by half. Add butter and cook for one minute. Seasoned with salt, pepper and crushed red pepper.